Generator WESTERBE 8 Kva from 1993 with only 230 Hours in a cocoon in the well insulated engine room. 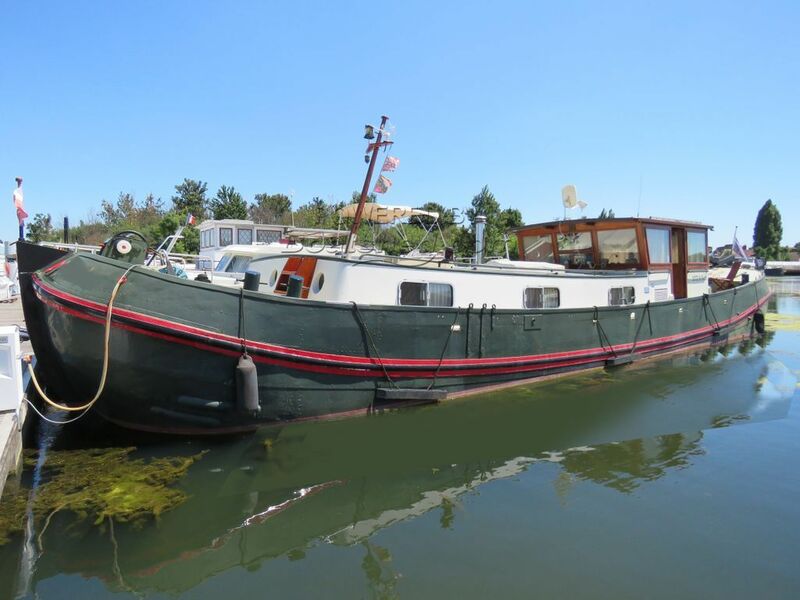 A 1901 riveted steel Tjalk completely converted into a live aboard barge by our current owner in 1993, it was professionally done by a Dutch yard according to the owner’s specification who has followed the works trough out. Last hull paint and new magnesium anodes done in 2016. Completely insulated with glasswool everywhere behind the hull, the quality of finish is obvious and our vendor has maintained his barge during his 25 years of ownership. Electric heads and basin opposite the main cabin and next door a shower room and a second basin. Forward cabin, with little headroom (only 1.67m to 1.85) with pigeon box to give more light. Two berths 140x175m on port side and a 110x175 on star board side. Bow thruster under the berth, battery under the wooden box. This cabin is mainly used as a storage room but also quite convenient for children or occasional guests. The corridor leads to a huge saloon open kitchen, nice lay out, cosy, with a huge seat around dinette, plus a leather stylish setee and a functional multi fuel stove (main source of heating on the boat apart form the petrol and electric heater for extra confort). No central heating eitherwize but channels and pipes are installed for a potential blown air system if wished. Open galley with all the necessary like at home, 4 gas burner, electric grill and oven, a micro wave, a 220V fridge and freezer and an extractor. No washing machine or dishwasher available but pipes are in place. Going up to some steps (90cm wide) to a huge wheelhouse used for piloting the boat but also used as a saloon, with views outside, large double glaze windows, collapsable wheelhouse if needed, and 2 side doors to easily access the deck and manœuvre the boat or just go to the aft deck. From the wheelhouse, you can access down some steps, the engine room (spotless and tidy) with a restricted headroom of 1.50m. and also an aft cabin with a double berth 160x190 and headroom of 1.75 to 1.92m. An incredible and unusual outside wheel with enough space for an outside deck chairs and table. The outside roof space is almost flat and can also be used for sun bathing. Large side deck to access the foredeck and windlass. Live aboard barge tjalk for sale in France. Boatshed Bourgogne is happy to offer this very well converted Tjalk type, quality and taste have been put into this live aboard barge which will make an ideal family cruiser in less than 18m or a perfect live aboard floating home. Regular visible maintainance, mainly done professionally. Mooring could be transferrable with port authority approval and if required, to this local yard and marina facilities, central France. For more information or organise a visit, please contact Magali Wharmby, your local broker at Boatshed Bourgogne. This Dutch Tjalk Converted Barge has been personally photographed and viewed by Magali WHARMBY of Boatshed Bourgogne. Click here for contact details.